The North American tomato processing industry is distributed across four distinct regions: Mexico, the United States excluding California, Canada and California. Of these four regions, California is the biggest, with close on 93% of the volumes processed over the past three years. It is followed by Canada (3.5%), other US states (3.4%) and Mexico (0.3%). California also occupies first place in terms of yields (between 98 and 108 mT/ha (45 to 50 sT/acre)), ahead of Canada (86 to 98 mT/ha), other US states (65 to 75 mT/ha) and Mexico. Mexico grows large volumes of tomatoes (3.4 million mT in 2017/2018), and has started to produce processing tomatoes. Several reasons account for this situation. Firstly, the proximity of the huge US market, where table-tomato growers have developed strong distribution strategies. The production of tomatoes for the fresh market is extremely costly in terms of labor, and Mexican growers benefit from the competitive advantage of much lower labor costs compared to the USA. This is why a number of US growers have invested in Mexico, which now functions as an important supply base for the USA. Production has recently evolved with techniques that are more protective of the crops, called "shade production" (greenhouse/shade and tunnels), which are more costly but also more productive, giving better results in terms of quality and avoiding a lot of the risks. This provides better guarantees for supply requirements. It is likely that the system, which has given good results, will continue to function in the future. Mexico only processes small volumes of tomatoes (approximately 50 000 mT), in a context where the production and shipping of fresh tomatoes is more profitable than processing operations. The US industry "excluding California" is actually a very small region, with an annual production of between 400 000 and 500 000 mT, mainly located in Indiana, Ohio and, to a lesser extent, in Pennsylvania. Agricultural yields are relatively variable and lower than those recorded in California, and the prices of tomatoes are comparatively higher than those of California and the rest of the world. This has led processors in these Midwestern states to specialize in peeled tomatoes and sauces, rather like operators in the South of Italy, producing virtually no tomato paste. These states benefit from a number of advantages that are favorable to these specific product categories: industrial operations are particularly concentrated, they record very high performances and work all year round, notably using tomato paste that they buy off other processors, mostly in California, in order to produce sauces. 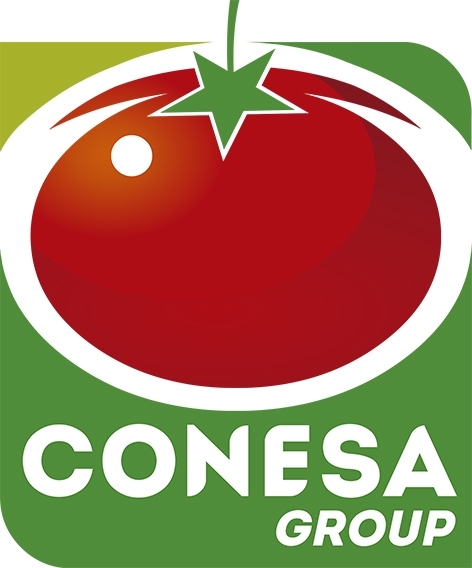 They produce canned peeled tomatoes in small conditionings intended for the retail market and the food service sector. They are geographically close to the major concentrations of US population, which grants them a strategic advantage in terms of shipping costs compared to their Californian competitors. According to Greg Pruett, decisive change is unlikely to affect this sector in the present context: the pursuit of current industrial strategies indicates that processing volumes (approximately 500 000 mT) are not likely to evolve anytime soon. That said, there a real possibility of seeing the US industry move over to more flexible and/or lighter packaging, which could negatively impact the strategic advantage that these operators currently enjoy in terms of shipping options. Finally, like in neighboring Canada, these operators must face some long term challenges linked to agricultural and environmental issues, as well as global warming, and the need to increase yields and prolong harvest seasons. The volumes processed in Canada are also estimated at about 400 000 mT (against more than 500 000 mT before 2012, when the Heinz plant in Leamington was operational). 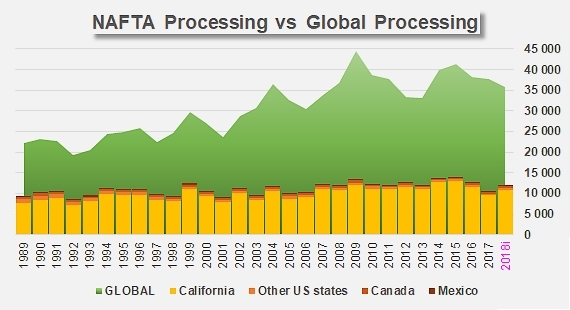 Agricultural yields for processing tomatoes in Canada are very high (almost equal with those of California in 2017) and particularly competitive at a global level. The price of one tonne of raw tomato is relatively high, especially given significant focus on concentrates; prices are set in good part based on USD/CAD exchange rate and rail freight from California to Canada, which means that competition with California is tough, particularly in the paste sector, even taking account of the commercial advantage linked to the relative weakness of the Canadian dollar. Indeed, the future of Canadian tomato processing is closely tied in with the potential consolidation of the Canadian dollar against the US dollar, as demonstrated by the improvement of Canadian results thanks to the weaker Canadian dollar over the past three or four years. Opportunities have opened in the sector of low concentration products and/or for products specifically labeled as being Canadian. Potential changes to the NAFTA agreements and the current trade policy of the United States are topics of major concern for Canadian export operators, insofar as they could alter the rules of free access to the US markets for pastes and other Canadian tomato products, making these items less competitive. In the long term, the possible institution of new trade barriers could benefit products that are manufactured in the Midwest. In the words of Greg Pruett, "California has a couple of success factors that it needs to address." Firstly, it has to manage a situation resulting from the increase in processing capacities that was intended to support the development of exports after 2007/2008, during a period of time that saw a sharp erosion of foreign demand for tomato products, an increase in worldwide production (Algeria, Ukraine, etc. ), a consolidation of the US currency and a stagnation (if not a drop) in domestic consumption. 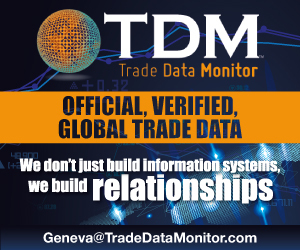 Driven by investments that were decided when the US dollar was at its "weakest" and by the hope that this favorable situation for Californian exports would last, current capacity now exceeds 14 million metric tonnes, for an apparent demand of about 12.5 million mT. In the short term, the combined effect of these dynamics has led to a notable and unsustainable drop in profit margins for growers and processors in recent years. The most obvious solution to this problem would be to reduce production, as was mentioned by Mike Montna during his opening presentation at the first session of the Congress. Existing opportunities might require additional consolidation within the Californian industry and further plant closures, but such a reduction in processing operations seems difficult given the currently installed capacity. One option would be to shorten the duration of the harvest, with growers focusing on other alternative crops, as is already the case to a certain extent. Last year, planted surfaces were at their lowest for the past 25 years. Another solution would be to increase demand, either by focusing on a development of exports (an evolution that is known to be fundamentally dependent on economic and commercial policy and, potentially, on the future contraction of Chinese exports), or by reinforcing domestic demand. Experts now agree that US consumption can at best be described as "sluggish", on a mature market that is unlikely to be re-energized, given the virtual absence of investments and innovations in terms of products or packaging, and which is still awaiting a hypothetical boost from nutritional or health allegations. Today, the US industry finds itself in a delicate position, all the more so for the fact that current food trends in the United States are promoting "fresh products" and "low sugar products", to the obvious disadvantage of demand for tomato products, most notably ketchup. Official figures show that ketchup consumption dropped 6.8% in volume in the United States between 2012 and 2017, a result that Greg Pruett describes as being of significant concern. It seems likely that this trend will be confirmed in coming years, forcing US processors to find alternative products that could absorb currently produced volumes of paste. The biggest problem of the current situation in the USA is that operators seem unable to benefit from the nutritional and health advantages of tomato products: "Tomato paste and sauces are safe, healthy ingredients but most marketers treat them as flavor-neutral additives that need to be value-costed to their minimum levels." 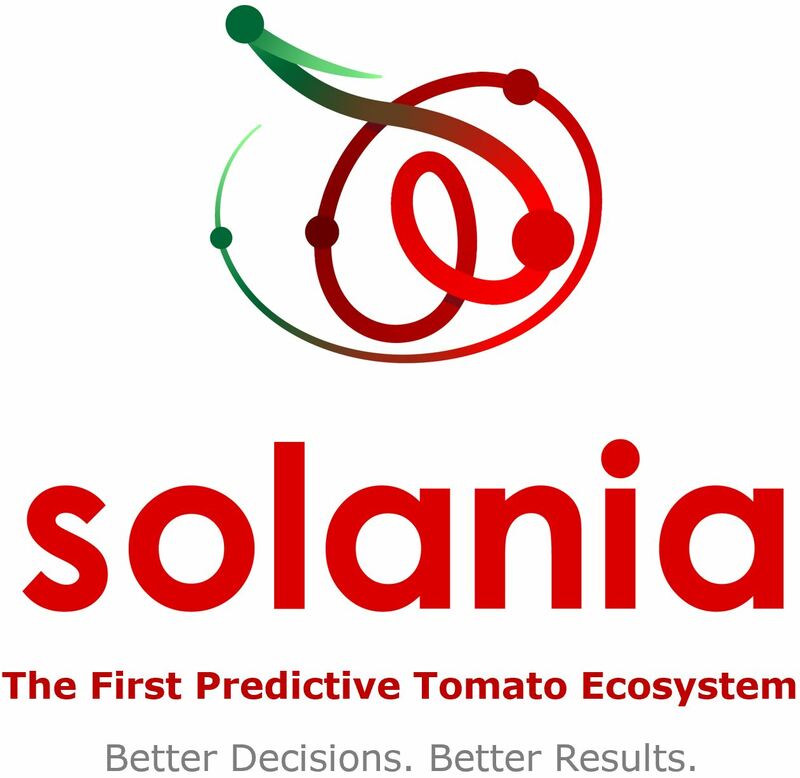 The challenge for US processors is to up their game by convincing buyers to consider tomato products as highly valuable. Many of the remanufacturing operators are attempting to reduce as much as possible the proportion of tomato paste that they use in their preparations, to the point that the question is now being asked: "How much tomato can we take out and still call our products "ketchup" or "pasta sauces" [..., while] consumers are demanding more transparency and healthy products?" 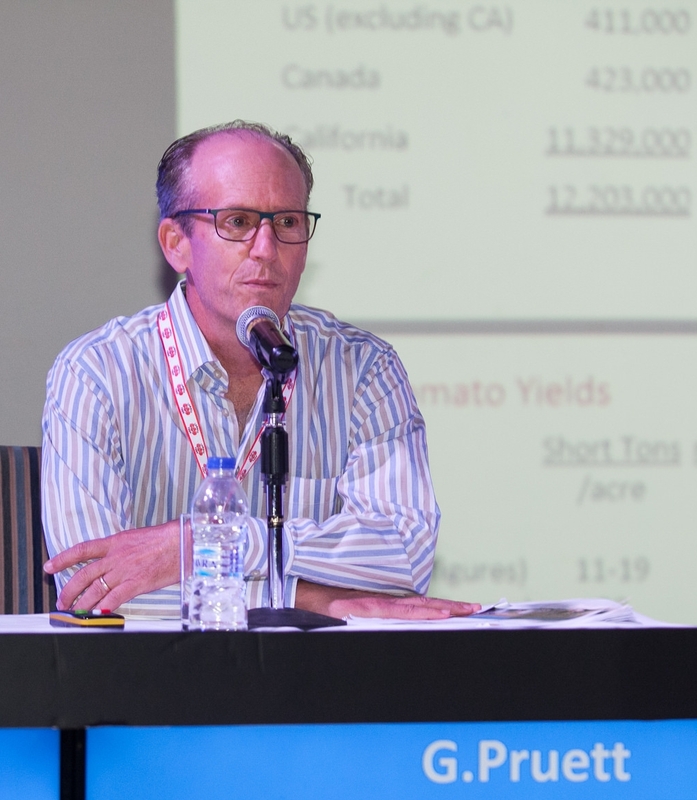 Secondly, in addition to the difficulties caused by excess processing capacity, the Californian industry must improve agricultural yields which are, according to Greg Pruett, blocked at about 48 sT/acre (104 mT/ha), and have not noticeably improved in the past nine years. Although this level of productivity is satisfactory on a global scale, it has only shown sluggish progress, with Californian agricultural costs per surface unit (labor, irrigation, seeds, plant health inputs, regulatory constraints, etc.) increasing year on year, which obviously leads to much higher pressure on the price of raw tomato. In these conditions, it is becoming difficult for industrial processors to raise the price paid to growers, given the currently low levels of worldwide prices paid for tomato products. As demonstrated in a recent article on the evolution of global yields published in Tomato News, it is clear that the gap in yields between the different tomato growing countries has considerably narrowed over the past two decades, with a worldwide average that has progressed 60% since 1997, and reached approximately 83 mT/ha in 2015-2017. The competitive edge enjoyed by California thanks to its agricultural advantages has been considerably eroded. The solutions proposed by the Californian industry to these various issues mainly consist in increasing its use of technology: a number of opportunities are currently being considered in the area of machines for automatic transplanting, plant-health treatments and weeding by robots, sensor-controlled irrigation, advanced drip irrigation systems, etc. It is also possible to grow tomato varieties with higher yields, improved disease resistances, increased soluble solids contents and better compliance with consumer expectations in terms of aroma, favor and phyto-chemical composition. The Californian industry has not excluded a possible geographical shift of the regions where processing tomatoes are grown: by choosing regions more suited to this crop, it is hoped that the influence of low yield areas might be reduced. The potential of state-of-the-art technology is also being considered (GMO, CRISPR genetic engineering) in order to develop new varieties. Once these goals have been reached, the results should allow noticeable improvements in the cost structure of production and lead to adjustments in the prices of raw materials, while maintaining the competitive edge of Californian products on the worldwide market. California enjoys some of the best conditions for growing processing tomatoes in the world, and includes the biggest and most technologically advanced growers and processors. In conclusion, Greg Pruett was optimistic: "With some assistance from our product marketers on the demand side and bureaucrats on the trade side, we will come out of this tough time better equipped for future success."